THE President has written the Leader of the Opposition, Bharrat Jagdeo, to inform him that he is prepared to name a date within the confines of the advice of the Chairman of the Guyana Elections Commission (GECOM) who relayed the commission’s ability to hold elections no earlier than November 2019. 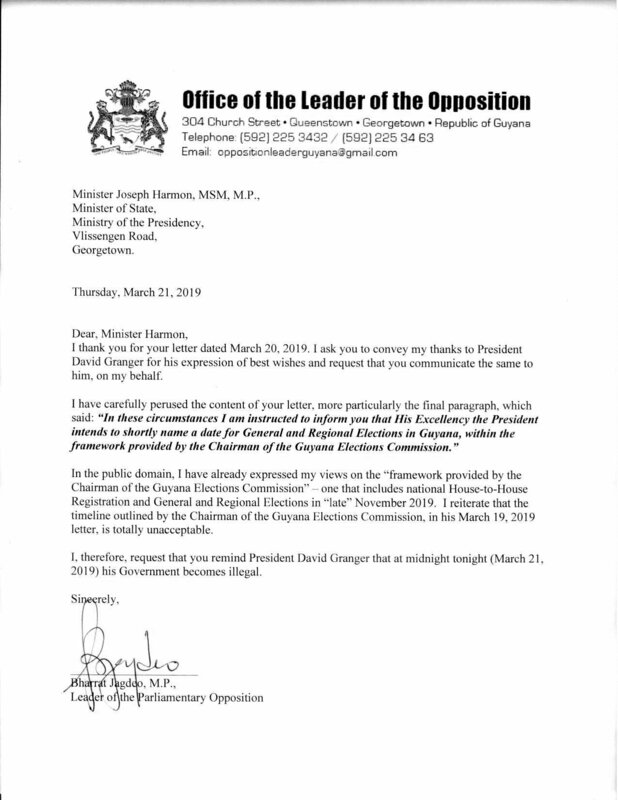 According to Minister of State Joseph Harmon, who made the announcement at an outreach to Constituency 12 on Wednesday, the letter was delivered to the Opposition Leader also on Wednesday 21 March 2019. The Minister of State had moments ago completed a walkabout in the constituency after which he gathered with supporters and community leaders at the Tucville playfield. Harmon met with the residents to speak to their concerns in the present situation. Firmly putting away the current rhetoric, the Minister of State affirmed that there is no impending constitutional crisis in Guyana. “There is no crisis. A Chinese philosopher once said that ‘where some people see crisis, others see opportunity’. I believe we have an opportunity now based on what has happened in the National Assembly to have a fresh look at the way in which we work together to develop our country,” Harmon said. He reminded that the Constitution provides that there will always be a President and government in place and irrespective of what takes place, there will not be a “gap” in government. The Minister of State noted that it is important that Guyanese, as right-thinking citizens, are able to differentiate the truth from propaganda. He highlighted that this propaganda is primarily being peddled by the Opposition and its leader, Bharrat Jagdeo, who, with his eyes set on the oil production in 2020, is now in such a desperate position that he has begun to “construct” an impression of a crisis in Guyana. The Minister of State noted, however, that during Jagdeo’s two and a half terms –during which he sought a third— Guyana descended to being labelled as a “pariah state”; over 400 men and women were murdered and drug-running was the order of the day with “corruption on an industrial scale”. These were some of the epitaphs which accompanied the word ‘Guyana, under the ‘Champion of the Earth’,” Harmon said. He stated that the Opposition Leader is now attempting to secure a third term through a “backdoor” by giving the impression of remaining in the background while controlling the narrative up front. Harmon then put into perspective the Opposition Leader’s crass remarks at the Babu Jaan, East Berbice-Corentyne stage, meant to pay homage to late President Dr. Cheddi Jagan, where he called on supporters to “chase” members of the government. “He’s running crazy and this is all because of what is happening offshore,” Harmon said. However, the Minister of State highlighted that Jagdeo’s aggressive behaviour has not changed from his actions in 2011, when he saw to it that a teen was remanded to prison for allegedly showing his middle finger to his convoy. Harmon assured the gathering that the Opposition Leader, though brazen in his ways, will not go unpunished for his actions. “He is not the President and he’s not going to threaten the people of this country. He’s not going to threaten public servants because, to the extent that he threatens them and those threats are acted upon…there will be consequences for his actions,” Harmon promised to the applause of the crowd. The minister was keen to add, however, that despite the current negative rhetoric, the present government represents “stability” and “order” and will never support or call on citizens to engage in unmannerly or illegal behaviour. “We should not be cowed by language that seeks to evoke unnecessary ire and emotions of people. It is unnecessary and we believe it is intended to create division among our people,” Harmon said. immediately and others will take a little longer, but be assured that all of the matters which you raised will be dealt with,” he said. At the meeting, it was announced that come next Wednesday, a number of ministers of government will be making themselves available to the public on a one-on-one basis at the Square of the Revolution.